Since the 1960s a resurgence of interest in the moral foundations of politics has fueled debates about the appropriate sources of our political judgments. 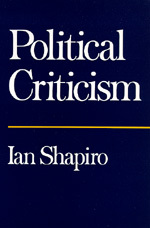 Ian Shapiro analyzes and advances these debates, discussing them in an accessibly style. He defends a view of politics called critical naturalism as a third way between the neo-Kantian theory of John Rawl's and the contextual arguments of Richard Rorty, Michael Walzer, Alasdair MacIntyre and others. He formulates a new justification for democratic politics and an innovative account of the nature of political argument.